The field sales staff of Rapelli, the well-known manufacturer of meat specialities from the Ticino region, visit their customers armed with an iPad. The tablet provides a product catalogue with customised, up-to-date prices, information about forthcoming offers, product illustrations and ingredients. They can enter orders directly on the iPad using the order wizard. PARX developed the order platform with its integrated product catalogue, based on the Salesforce platform, within six months. Rapelli is one of the market leaders among meat processing companies in Switzerland. The ORIOR Group, Rapelli's parent company, plays a leading role on the Swiss market in the premium convenience food sector for retail trade and the restaurant industry. The Ticino-based meat speciality company supplies all of the big distributors and restaurants, as well as shops and kiosks in the region, all of which receive regular visits from the sales department. This adds up to 2,500 customers in the Ticino region, who are offered a choice of over 900 products and product variants. Until now, the field sales staff have used a pdf price list on their iPads. The price list was re-issued once a week and included only the generic prices, not the special conditions for each customer. If a customer asked for information about product ingredients, the sales rep had to provide the clarification. Daily offers were communicated by e-mail. «If the sales rep offered special discounts, he could not be certain what the remaining margin was, the sales back office had to check», says Martin Bösch, Sales Office Manager at Rapelli SA. The field sales staff took the orders on paper and passed them on by phone or e-mail to the sales office. There they were entered in the ERP system, a highly intensive manual task that often resulted in queries which had to be resolved before the order could be processed correctly. «We worked for about three years on organizing all of our sales processes more efficiently. Over this period, we also made data from the ERP system available to our sales reps in a comprehensible form. But the ERP only works on desktops, which meant that this solution was not practical for field sales. It then became clear to us that certain processes could only be organized more efficiently with a new IT solution and we consulted our Group CIO. He advised us to select an existing software solution and not to develop it ourselves, and to reduce the project to a core process. We chose order entry, together with the product catalogue and price list functions, as the core process. Thanks to the 3-year development period,we were able to define what we wanted very precisely and to implement it efficiently», says Martin Bösch in describing the detailed preparatory work that certainly paid off. Rapelli evaluated three different products and opted for Salesforce, as it is designed for CRM tasks and is clear and easy to use. «PARX came highly recommended to us. At the joint workshop, we immediately felt that PARX understood us. Their demonstration of a typical customer example won us over, as did the quotation, which fell within our budget», says Martin Bösch. Rapelli appointed PARX to develop the product catalogue including the price list and an order entry system based on the Salesforce platform. The catalogue was to include all 900 product variants together with all of the illustrations, ingredient information, customer-specific prices and forthcoming offers. It was to be based entirely on SalesForce1 and run on the iPad. «The focus is on user-friendliness and not on an overly elaborate design», says Martin Bösch. PARX delivered the order wizard in six months from the specification to the live launch. After a specification phase of one month, the iterative implementation took three months. During this period, Rapelli was able to take a look at the current status of the product catalogue and order entry tools several times and make requests for optimisations. These were carried out throughout the process and a solution was developed that matched what the customer had in mind. Thus, for example, the information had to be compressed to make the data easy to read and clear on the small iPad screen. There then followed a month of tests. With 2,500 customers, 2,400 different product variants with just as many product illustrations and a total of 2,800,000 different price variants, the data migration from the ERP system into Salesforce was particularly challenging and time-consuming. For this purpose, the data was migrated from the ERP to an FTP server and from there into Salesforce using Talend. Every day, an update is sent from the ERP system to Salesforce, in which new master data such as new customers, new products including illustrations, order histories and the latest daily prices are communicated. Salesforce calculates the customer-specific price on this basis. This made the connection to the ERP system for the price calculation process particularly complex. The field sales rep now places the order on an iPad while he or she is with the customer. 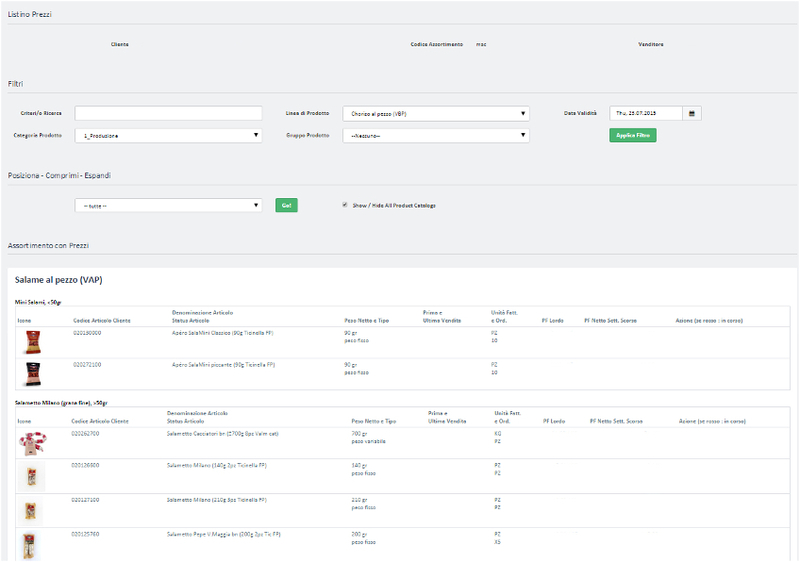 The order wizard only shows the products available to the customer at the customer's specific price on the requested delivery date. Thanks to the illustrations and the precise description with details of ingredients, the customer can simply select the products. In addition, the order wizard displays the price for the previous week, the current week, the next week, the next scheduled offer and the last price paid. In this way, the sales rep can arrive at the best delivery time and therefore the best price with the customer. A traffic-light system shows the sales rep whether the special discount being offered provides an adequate margin. The order is transferred and generates a structured e-mail to the back office for recording in the ERP system – a process that will become automatic at a later date. The aim was to receive 150 orders a day via the order wizard and thus to reduce the queries going back and forth between the sales office and field sales massively. After just one month, over 100 orders a day were being entered via the wizard. Now the figure is 2,000 orders a month. «At the start of the project, our CIO advised us to keep things small and fast. He was right, because that's how we arrived at such a good solution so efficiently. Now it is a matter of developing everything further», believes Martin Bösch. Rapelli is now planning to import orders directly into the ERP system via an interface and thus do away with the structured e-mail that is now used to communicate the order. Martin Bösch continues: «The time saved in the back office will then be considerable.» Moreover, Salesforce is also to be used for key account management for the rest of Switzerland, but with a different focus (more advice, fewer orders taken). The Orior Group – Rapelli's parent company – also has its eye on Salesforce for other subsidiaries and is trialling further deployment of Salesforce.